Chris Hardy--Garret Replogle and Natalie Harris in their last performance together on Wallace Theatre stage for Macbeth. The end of the year draws near and seniors are preparing themselves for the next steps of life. Theater seniors are no different. This year they are ending this year with a Shakespeare classic.Along with fellow cast and crew, the California Baptist University theater program, under the direction of Krista Jo Miller, director of the theater, brings one of Shakespeare most in depth and emotional plays to the Wallace Theater stage. 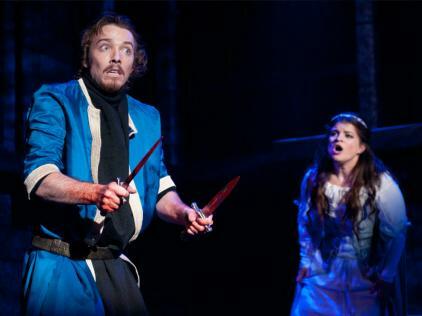 “The Tragedy of Macbeth” is the story of a Scottish soldier, Macbeth (Garret Replogle) and his wife, Lady Macbeth (Natalie Harris), driven mad by guilt brought upon themselves by a stolen crown and shame caused by the murder of their kinsmen. Lady Macbeth is usually portrayed as an ambitious woman who lusts for power. However, Natalie brings the character into a new light. Macbeth’s encounter with the three witches (Rachel Verret, Ashley Setzler, Katherine Loughman) turns his eyes to greed for the crown and the start of his murderous rampage to conceal and protect himself. These dark forces play a role in the challenge between the good side and the evil side: The antagonists and the protagonists of the play. The major conflicts of the play is the struggle between the murderous evil represented by Macbeth and Lady Macbeth and the best interest of the nation, represented by the son of Duncan, the fallen king, Malcolm (Ethan Park) and the Thane of Fife, Macduff (Joseph Mayers). “In the overall arch of the show, he is the good guy, as people would say,” Mayers said of his character Macduff. For theater seniors like Replogie, Harris, Mayers and Loughman, “Macbeth” stands as their last production with CBU’s theater program. For Mayers, it is a bittersweet feeling to be leaving. The drama awaits audiences until the show closes April 16. “It’s been a great cast probably the best crew that I have ever worked with and has come with a lot of discovery,” Mayers said.